This all steel construction rear multi-carrier bumper has been designed to improve your off-road, rock-climbing performance. The tough, integrated design provides for optional fully welded tow points and other accessories such as gas can carrier, backup lights, jack mounts and more. The optional swing-away tire carrier will easily handle up to a 36" tire and optional gas can carriers and jack holder fully equip your vehicle. The MultiCarrier is not compatible with an existing hitch package because it requires the same mounts to the frame, however, we do offer a receiver hitch option to be added on to your rear bumper. Price shown is for the base bumper, you build from there. 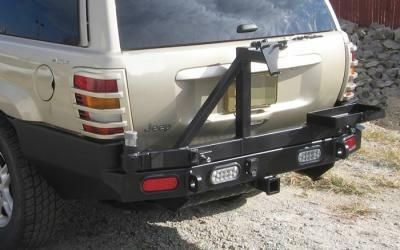 Note: The MultiCarrier bumper is not compatible with an existing factory hitch because it requires the same mounting points on the frame, you will need to add the receiver. Comes standard in a black painted satin finish. All welds are ground and finished to give a professional, high quality appearance. Made with the highest quality standards by experienced craftsman using the latest technologies to ensure a precise fit every time. Our bumpers are 100% made in the USA by American craftsman and materials!